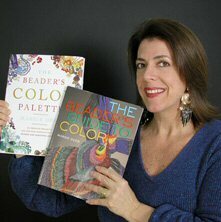 12/7 MARGIE DEEB BOOK PRIZE The Beader's Color Palette by Margie Deeb has been voted by the prestigious Library Journal as the BEST HOW-TO CRAFT book of 2009. This is quite an honor because it is for all craft books not just bead related volumes. Congratulation Margie. 12/7 CAITLIN HYDE CLASS Almost all of the seats in Caitlin Hyde's February class were filled at the December meeting. Only 3 spaces remain so book quickly before they fill up. Caitlin makes the most interesting beads and Marcy Lamberson said she is a fantastic teacher. Click here for more info and to see the types of beads she will be teaching. Web Mama is signed up and can't wait. 12/7 DRESS DOWN FOR THE KIDS Margo Knight sponsored a fund raiser at her office for Beads of Courage. For a contribution to the cause, staff member in her legal firm could dress down for a day. She raised over $700 for BOC. Wow! 12/7 MURRINI FUND RAISER Stephanie White raffled off one of her complex murrini chips and raised $165 for Beads of Courage. Stephanie also made 35 Red and Green Christmas beads for the BOC staff nurses. Thank you Steffi for all you do. 12/7 ARTIST OPEN HOUSE Brian Renoud and Becky Sizemore will be selling their beads, pendants and jewelry at siye-hglass 2480 Memorial Drive Atlanta GA 30317 on Sat Dec 12 10-6 and Sun Dec 13 11-5. Six other glass artists are also participating. 12/7 ROMA CREATIONS A new bead store has opened on Peachtree Industrial Blvd in Suwanee, GA. Click here for more info. 12/6 ALL MEMBER SHOW At the November meeting, members were invited to bring their beads and jewelry for display. We've just put some photos up from that meeting. Click here to see beads made by Margo Knight,Brian Renoud, Andrew Lunde, Maureen Lovell, Joan Houghton Theall, Gerry & Stephanie White. Camille & Robert Simmons, Martha Fuerst and Linda Edmunds or use the Scrapbook button on the right. 12/1 *** RESULTS MEMBER SURVEY The SF Member survey was conducted in October 2009 and was sent to current 2009-2010 members and past members of Southern Flames. 62 people completed the survey 53 of which are current members. Those of you who have experience with surveys, know that the response rate was phenomenal. So thank you to all who responded but most especially to our SF Secretary Maureen Lovell who conceived, developed and compile it.The survey was conceived, developed and compile by SF Secretary Maureen Lovell Click here to read the results. 12/1 CYNTHIA RUTLEDGE AT BBD To those of you who bead as well as make beads, well know beading artist Cynthia Rutledge will be teaching classes and having a trunk show at Beads by Design. The trunk show will be on Sat Dec 12 at 5-7 PM. For the class schedule and to see the class projects check the Beads by Design Website or call (770)425-3909. 12/1 CHATTAHOOCHIE FESTIVAL Marcy Lamberson will have a booth at the Chattahoochie's Back to Nature Holiday Market and Festival on SAT DEC 5 10 AM-4PM. Forty vendors, scavenger hunt, crafts and face painting for the kids, music, coffee and hot chocolate. Sounds like fun and a good place for Christmas shopping. At the Chattahoochie Nature Center. 11/28 CAITLIN HYDE CLASS LOTTERY We are excited to announce that Caitlin Hyde will be teaching 2 classes at Southern Flames in February 18-19 & 20-21. The lottery for this class will be at the Holiday Party - Dec 5 Meeting. Click here for Class Details and Lottery Forms. And check out Caitlin's Web site - her beads are extraordinary. If you cannot come to the Dec 5 meeting, your check for $350 must be received by Dec 4. 11/28 RESOURCE CENTER UPDATED Karen Barefield has sent us an updated list of items available for borrowing in our Resource Center and we have added the new books, videos, demo tapes, presses, tools and magazines to the list we keep on the website. To see what is available click here or use the "Resource Center" button to the right. 11/17 BEADS OF COURAGE BEAD-A-THON During Beads by Design Open House - See dates/hours listed below No need to sign up for a specific time, just come when you can. Please bring any tools you want to use. Some glass will be provided but if you want to use specific colors, feel free to bring your own. Mandrels will be provided. 11/12 NEW YEARS BEADING RETREAT Sylvie Lansdowne is offering an amazing beading retreat during the New Year's weekend. Click here to get all the details. 11/11 NEW SCRAPBOOK PHOTOS Check out the new photos in the SF Scrapbook. Click here to see the photos Fred Fuerst took of Heather Trimlett's demo. Then for some more eye candy, look at the beautiful photos that Marcy Lamberson took of Heather's classes and beads by clicking here. 11/10 BEADS OF COURAGE WEEKEND Beads by Design will be hosting a Beads of Courage Bead-a-Thon during their open house the weekend of Nov 20 - 22. We will post the hours that the torches will be open as soon as we the info is available. And by the way, the entire complex is usually open during that weekend. While you are there you might want to visit some of the other fascinating workshops in the building. The Web Mama did it last year and found it totally amazing - all sorts of unexpected artisans work in the studios contiguous to BBD. So make some beads for the BOC kids and then treat yourself to a tour. 11/10 BEADS BY DESIGN SALE Beads by Design has just got in a large selection of gemstones and pearls and has some really good deals e.g. $5.00 strand for many gemstones; 50% off cube shell strands ($2.50) and half price Sterling Silver charm bracelets ($9.00). Making a charm bracelet is a great way to use small beads you have collected from other beadmakers and they make very special gifts if you mix your own beads with a silver charm or two. Take a look at the sale items on the BBD Website. 11/10 BEADS BY DESIGN CLASSES The schedule for beading classes and wire wrapping classes to be offered at Beads by Design in Nov and Dec is now posted on their website. Click here for November or December classes. 11/10 SF SURVEY RESULTS Maureen Lovell has tabulated the survey sent out to Southern Flames members and will be summarizing it for us. There was a 71% return rate for the survey which anyone who has distributed surveys knows is more than fabulous. So thank you members for responding and thank you Maureen for all the work that goes into a project like this. 11/10 BEAD AND BUTTON SHOW Cristie Prince has been selected to teach a class a this Spring's Bead and Button Show. Way to go Cristie!!! When the class schedule is posted (probably in January) we will add a link so you can see what Cristie is teaching. 11/10 XMAS BOBBLE HEADS Marcy Lamberson will be teaching "Santa and Christmas Elf Bobbleheads" at FlameTreee Glass in Roswell, GA on November 14. Click here for details and to register. And speaking of Marcy, did you know that she won first prize in FlameTree's Halloween Bead and Sculpture Contest - a Phantom torch!!!! Well deserved - her entry was technically difficult, visually pleasing and as usual, Marcy-whimisical. 10/16 BEAD & BUTTON 2010 Cristie Price has been asked to teach seven beading classes at next years prestigious Bead and Button show. Congratulations Cristie! 10/16 SELL YOUR BEADS 11/8 Start getting ready for November Meeting All Member Show. It is on Wed 11/8 and you will be able to display and/or sell your beads and jewelry. 10/16 SELL YOUR BEADS 11/20 Hammond Glenn Senior Community Center are are putting together a Shopping Day on Friday, November 20th from noon to 4 pm, for residents (and other folks) that will be advertised around Sandy Springs. If you would like to set up a table there, the fee is a $10.00 donation. That's it. You can keep all proceeds from any sales. If you are interested call Lynn Piacentini at 404-256-6300 or contact her via email at: hammondglen@yahoo.com. Deadline: She needs folks to sign up by October 26th. 10/16 MURRINI RAFFLE for BOC To help raise the money needed to provide O2 for the Beads of Courage days to be held during the BEADS by Design open house in November 20-22, Stephanie White will be raffling off one of her hand made murrine (a large cat head; Tickets are $2.00 each and can be purchased at our October Meeting or from the staff at Beads by Design. The drawing will be during or just after the October 24 meeting. 10/16 XMAS BOBBLEHEADS Marcy Lamberson will be teaching “Santa and Christmas Elf Bobbleheads” at FlameTree Glass in Roswell Georgia on November 14th. Got to www.flametreeglass.com for more details and to register. 10/3 NORCROSS ART FEST This weekend Oct 3-4, Diane Kovach and Donna Myrick will have at the Norcross Art Fest in downtown Norcross. For more information and directions go to http://www.norcrossartfest.com/. SEPTEMBER MEETING PHOTOS Lance McRorie, who can do about anything, with any type of class made a crystal frog for us at the September Meeting and Fred Fuerst sent us some photos of the demo. Click here to see them. Thank you Lance and Thank you Fred. 9/29 ALL MEMBER SHOW At our November Meeting we will invite members to bring their beads and glass bead jewelry for show and sell. No jury; no entry fee - open to all members. More details soon. Start getting ready now! 9/29 HALLOWEEN CONTEST FlameTree Glass is sponsoring it Annual Halloween Glass Bead and Sculture Contest. The prizes are torches!!!!! Click her to read all the details. 9/29 OCT NOV CLASSES AT BBD Listings for classes to be offered in October and November are now available on the Beads by Design Web site. Click here to see them. The photos of the projects are beautiful and a BEGINNING SOLDERING all day workshop is being offered by Gerry White for the first time..
9/16 HEATHER TRIMLETT MARBLE BEADS There are still a couple of openings for Heather Trimlett's class on Marble Beadmaking Click here for more info or get in touch with Margo Knight. Heather is one of the Lampworking community's best teachers. Photos from Beads of Courage Day, Lots of great photos of SF members making beads and of the wonderful FlameTree Glass studio. But who is he dude with the blue mohawk??? and were his beads as fabulous as his haircut. More Photos from the Gathering This album includes lots of yummy bead photos (you will recognize work of lots of well know beadmakers.) It also includes photos of some new tools introduced at the Gahtering. At the end of the album are photos from our August Meeting where Suzanne Pattrerson discussed her experiences there. 9/8 GATHERING BAZAAR & EXHIBIT PHOTOS The Web Mama also took photos at the Gathering - at the Bead Bazaar and at the Coconut Grove Gallery where the Convergence Exhibit was displayed. Click here to see them. 9/8 BEADS of COURAGE DAY On August 22 FlameTree Glass hosted an all day beadmaking session for the BOC kids. About 15-20 beadmakers made 145 beads. Click here to see a photo. 9/8 10,000 BEADS Beads of Courage has a brand new website. And our own Lillie Bavendam is recognized on it for contributing more than 10,000 beads to the BOC program. Bravo, Lillie! 9/8 YELLOW DAISY FESTIVAL C06 Donna Myrick and her sister Diane Kovach will have a booth at this year's Yellow Daisy Festival at Stone Mountain. The fair is the weekend of Sept 10,11,12,13 (Thurs - Sunday) and you can find more information by clicking here. The booth is located in Section C #06 under the name DAUGHTER DOG BEADS.COM. 8/21 MORE GATHERING PHOTOS Fred and Martha Fuerst also sent us photos from the Gathering which we have put in the SF Scrapbook. Click here to see them. There is one more set of photos that will go up in the next few days so check back. 8/21 BOBBLEHEAD WORKSHOP Marcy Lamberson will be teaching a workshop at FlameTree Glass in November called Santa and Christmas Elf Bobbleheads. Click here for details. 8/21 MEMBER GALLERY GROWS We have just added bead photos by Donna Myrick,Diane Kovach, obert Simmons,Lillie Bavendam, Bonnie Anderson and Kim Colfer to the gallery. 8/20 MEMBER GALLERY - ADDITIONS & DELETIONS The Web Mama is in the process of updating the Member Gallery. If you contributed to the postcard and would like that photo in the Gallery just send the .CMYK file to linda@lilysteelebeads.com with any business info that you want with it. We already have new photos up from Kelley Wenzel, Maureen Lovell, Marcy Lamberson, Kristy Nijenkamp and Linda Edmunds. If you did not have a photo on the postcard but would like a picture of your bead in the gallery, just send any jpeg file. Click here to go to the Member Gallery. 8/20 GATHERING PHOTOS - A number of SF members have shared their Gathering Photos and we have just put the first set up. They were taken by Joan Houghton-Theall. Thank you Joan. If you would like to see them, click here. If you have photos to share send them to the Web Mama. And remember to check back to see more photos in the next week or so. 8/19 HEATHER TRIMLETT CLASS There are still a couple of open spaces in the two Heather Trimlett classes. If you want to secure a space before the classes are open to the public get in touch with Margo Knight. For more class information and registration forms, click here. Note price per class for SF members is 325.00 For non members the price per class is 350. 8/19 SF TEACHER UPDATE Becky Sizemore, co-president of SF is now teaching individual classes in her Home Studio in Atlanta. Click here for more information. 8/19 DAUGHTER DOG BEADS! SF member Donna Myrick has a new website www.daughterdogbeads.com Check out the website and Donna's beads. Both are adorable! Donna (who is the sister of Diane Kovach) also has an Etsy shop which you can access from her website. 8/19 MARKETING WORKSHOP The Atlanta Glass Art Guild is extending an invitation to the Southern Flames members to attend a workshop on Marketing Your Art for the same price they are charging their own members. "Marketing Your Arts is an interactive workshop. It is designed to help artists and related organizations develop a marketing perspective, define their market, understand how to package their message, and get them in front of prospective clients. The presenters work with participants on the fundamentals: crafting a message that helps customers understand the artist's work, components of successful press releases, useful resources to make marketing a little easier, and understanding all the opportunities available to get the word out." The workshop will be held on Sunday Sept 20th 1-4 PM at The Spruill Center in Dunwoody - Room #4. Cost is $20. For more details and the registration form contact Joy Hafner by phone at 404 257-9428 or by email joysclay@bellsouth.net. 8/18 GATHERING TIPS by SUZANNE Suzanne Patterson attended the 2009 ISGB Gathering as our SF Scholarship representative and as such was did a good bit of work at the meeting. She was able to give SF members and interesting perspective in the presentation she gave at the August meeting. Margo Knight had this to say about Suzanne's presentation " You did a really great job of painting the total picture, and telegraphing your excitement. I think you were able to make it a lot more real for people who've never had the chance to be there. That's something that's been missing from the after-Gathering meetings in the past. It's one thing to see all the goodies people bring back, but you were able to convey how much more the experience is than that! As part of her presentation, Suzanne put together some miscellaneous but very helpful technical tips which she sent us to post. Click here to go to our Tips and Techniques section and select Suzannes 2009 Gathering Tips. It is the top entry. 8/5 HEATHER TRIMLETT CLASS & FORMS Detailed information and forms are now available here for the Heather Trimlett class lottery. There are two different classes - Marbles on October 22-23 & Advanced Beadmaking on October 24-25. Each class is $325 for members - $650 if you want to take both. If you cannot attend the Meeting, checks and completed forms are due to Martha Fuerst by Aug 14. Any questions contact Margo Knight. 8/4 GATHERING PRESENTATION In addition to sharing our beads, tools and other goodies that we have been brought back from the Gathering, Suzanne Patterson who won the SF scholarship to the Gathering will make a special presentation about her experience attending the conference as a scholarship holder. Her remarks may start you thinking about applying for a scholarship yourself. 8/4 HEATHER TRIMLETT CLASS LOTTERY Information and form about the Heather Trimlett classes in October will be sent out shortly. They will also be available on the web before the Aug 15 meeting. If you need the information immediately, email Margo Knight at margo.knight@alston.com. The lottery for the class will be at the August meeting. 8/4 BEADS OF COURAGE DAY Mark your calendars. FlameTree Glass will be hosting open torches for making Beads of Courage on August 22 Noon to 6PM. No appointment necessary - just bring your favorite tools, and your safety glasses. Glass and mandrels will be provided. Go to the FlameTree website for more information and location. 8/2 GARAGE SALE PHOTOS Check out the SF Scrapbook to see photos from our Annual Garage Sale. 7/21 THE ISGB BEAD The Summer issue of the ISGB The Glass Bead is out. Don't miss the article by Marcy Lamberson on the spectacular beads of past ISGB President Sara Sally LaGrand. And there is also a photo of the bead that Marcy has in the Perspectives exhibit. The publication gets better with each new issue. 7/21 BBD CLASS SCHEDULE Beads by Design has just posted their class schedule for August and September and it includes Metal Clay, Macrame, Kumihimo, wire work, pearl knotting and more. Click here to go to their Website and then click on Aug or Sept to see the schedule as well as photos of the individual projects. 7/21 POSTCARD A SMASH! Many many thanks to Shannon Brickey, Kristy Nijenkamp and Cristie Prince for the the fabulous job they did to photograph, produce and distribute the 2009 Southern Flames Postcard. It is superb and as soon as we get a copy of the photo file, it will be posted on our Home Page. 7/14 GARAGE SALE FORMS Click here to display and print the forms for the Garage Sale. One form per item. 7/14 ONLY BEADS - NEW STORE A new bead store - Only Beads - has opened in the City of Atlanta on Spring Street - wholesale prices. Click here for address, phone and website and suggest you call to see if you need a business license to make purchases. 7/14 2009 GATHERING POSTCARD See it at the July Meeting and if you have a Bead on it, you will be getting some from Cristie Prince. 7/14 BOC DAY IN AUGUST Mark your calendars Sat Aug 22 - a day at FlameTree Glass to make beads for the Beads of Courage kids. More information as we get closer to the date. 6/24 TUTORIAL/E-BOOK ON REACTIVE GLASS Julie Ferguson (FergieBeads) who taught a wonderful class for SF on Reactive Silver glass has just written a terrific tutorial/Ebook on the subject. People who took the class received a copy to supplement what they learned in class. If you are interested in working with this new, beautiful but tricky silver glass you may want to treat yourself a copy. It is available from Julie's Etsy Shop. Click here for more information and/or to purchase a copy. 6/24 GREET NANCY STONE Nancy Stone is our new Southern Flames Greeter and we now have a lovely photo of her. Click here to see it and thank you to Fred Fuerst for taking it. 6/16 GARAGE SALE & SWAP We will hold our annual garage sale & swap at our July Meeting. So start collecting your glass related items - tools, rods, frit, books, tapes, DVD's, powders, beads, jewelry, display stands, etc - to bring to the meeting to sell or swap for something new and fabulous. For each item that you bring please complete a copy of the attached form and if you plan to sell rather than swap - bring some change. Click here to print the form and remember one form for each item!!! 6/16 DOWN THE STREET BEAD SHOW The Down the Street Bead Show will be this weekend June 20, 21 at the Galleria. Dads get in for free! DK Designs (Diane Kovach and Donna Myrick) will be there. Lots of classes. Click here to for more information and for a $1.00 Coupon. 6/11 WELCOME OUR GREETER Nancy Stone has volunteered to be our new SF Greeter. She will put out our badges, collect them after the meeting, keep the sign-in sheet and most important, help our new members and visitors to feel welcome. Thank you Nancy!! 6/11 TORCH TIME RENTAL $6 After keeping the rate for torch rental the same for more than 5 years, Southern Flames is having to raise the hourly rate by $1.00 per hour. Because of increased O2 and Propane cost, the charge for using SF torches is now $6.00. For more information about our Torch Rental polices and procedures, click here or on the Torch Rental button on the right. 5/29 MAY MEETING PHOTOS Fred Fuerst took photos at our May Meeting of the demo by Robert Simmons of a Wearable Butterfly Bead. Click here to see them. 5/29 ISGB SCHOLARSHIP WINNER Suzanne Patterson was awarded the Southern Flames ISGB Gathering Scholarship by the ISGB selection committee. Congratulations, Suzanne! 5/28 WEARABLE BUTTERFLY TUTORIAL Robert Simpson sent us a step by step tutorial for making the copper leaf and enamel butterfly bead that he demoed at the at the May meeting. It is listed on the Tips and Techniques section. Click here to check it out. 5/16 JULIE FERGUSON BEAD Fred Fuerst took some exquisite pictures of a bead he and Martha purchased When the Web Mama asked what kind of glass was used, Martha Fuerst wrote to Julie and we have added the description to the photo. Click here, then scroll down a bit to read it. If you are interested in seeing more of Julie's work as well as to read some tips about using silver glass, go to her website www.fergiebeads.com We have also added it to the Links page. 5/16 BOARD PHOTOS Photos of the 2009-2010 SF Board Members are up. Click here to see them. 5/13 SPRING FLING The 7th Annual Kirkwood Spring Fling will be held this Saturday, May 16 from 10 AM to 7PM in Kirkwood's Bessie Branham Park. Diane Kovach and Donna Myrick will have a booth there so stop by and see them. For more information and directions click here. 5/13 FRED FUERST PHOTOS Photos from Julie Ferguson's class and demo are now in our scrapbook. Lots of photos of her beads but the most spectacular are the ones that Fred Fuerst took of a bead purchased by Martha Fuerst. Click here to see all the photos. 5/5 MEMBERSHIP DUES Membership dues for Southern Flames 2009-2010 fiscal year are now due. You can send a check for 25.00 to our Treasurer or for a small service fee use PayPal to pay online. Click here for more information about these options. 5/5 ELIJAY BEAD STORE Kathy Benson has opened a new bead store in Elijay. It's name is Jumping Mouse Beads and it is open Thurs-Sun. Click here for address, phone and hours, Also Kathy says she is looking for instructors in kumihimo, metallic clay and fusing. 5/5 BBD MAY CLASSES The May schedule for beading classes at Beads by Design has been posted on their Web Site. Click here to see the schedule as well as photos of the individual projects. 4/28 WEBSITE DOWNTIME Over the next couple of weeks, the Web Mama will be moving the SF Website to a new ISP host which will result in about a 75% saving per year. During this time there may be some downtime and no updates. Please be patient and we will let you know when we are done - hopefully by early May. And thank you to our to our outgoing co-president Diane Kovach who has done a magnificent job over the past two years We are all going to miss your presence on the Board and your many, many contributions to our group. 4/16 BALLOT SF BOARD Voting for the 2009-20010 Southern Flames Board will take place at the April 25th Meeting. Click here to see the slate and the requirements for voting. If you cannot attend the meeting you can copy the slate, X the suggested candidates, or write in alternates and send the completed ballot to Becky Sizemore. Her email address is on the ballot. Deadline for email ballots is Noon on April 25. 4/14 TORCH FLAME OFF & BOC Robert Simmons has sent us a photos from the SF Torch Flame Off as well as a picture of the contributed beads.. In addition there is a photo of some beads made for a special little girl whose last name is Moon who wanted a purple bead with a yellow moon on it. Click here to see the photos in the SF Scrapbook. 4/12 CONVERGENCE CONGRATULATIONS to Stephanie White and Gerry White - one of their lampwork-beaded jewelry entries was chosen for the Convergence Exhibit to be featured at the Bead & Button Show and at the ISGB Gathering. 4/3 JEWELRY GIFT BEADS & BEADING SHOW Sat & Sun April 4 & 5 (10 AM-5PM) at the DoubleTree Hotel, 1075 Holcomb Bridge Road Roswell. If you go make sure to visit Diane Kovach and Donna Myrick's booth. For more info cal 770-739-0057. 4/3 DOUBLE HELIX GLASSWORKS Double Helix Glassworks has contributed a selection of silver glass for Julie Ferguson's class later this month. Thank you, Double Helix - we will add your website to our Links page. JEAN BARUCH & BEADS OF COURAGE Southern Flames was honored to have Jean Baruch, founder of Beads of Courage, attend our March Board Meeting. She was in Atlanta to meet with Robert Simmons who will assume the role of National Director of Bead Donations for BOC and to visit the Children's Healthcare of Atlanta program to which many of us have contributed beads. It was amazing to meet her and to hear her speak about the program at our Board meeting. Robert, who spent the whole day with Jean has written a summary of day. Click here to read it. 3/29 POSTCARD BEADS May 20 is the deadline for submission of a bead for the 2009 SF Postcard You can bring your bead to the April or May meeting and give it to Cristie Prince or drop it off with a completed form in the labeled box at Beads by Design. 3/29 BBD APRIL CLASSES Beads by Design offers a series of Beading Classes and the April schedule has just been posted. Click here to see the schedule as well as photos of the individual projects. 3/29 BEADING RETREAT Cristie Prince teaches Beading classes as well as glass beadmaking. This May (May 1-3) she is co-hosting a beading retreat in Cartersville GA. Click here to read more about the retreat and to find out how to register. 3/29 FLAMETREE SUMMER WORKSHOPS FlameTree Glass is hosting a slew of workshops and classes this spring and summer. Click here to see a complete list and then call FlameTree for additional info or go to their Website to register. 3/10 CLASS & MEETING PHOTOS Photos taken by Fred Fuerst of Marcy Lamberson's Butterfly Demo at the March meeting are now available in the scrapbook. We also have lots of photos posted of Marcy' beads and those that the students in the two classes made. Click here to see them. And don't forget to check out the Studio Marcy Blog It is updated every day and has an amazing collection of tips, tutorials, links and general information about tools, business, contests, etc. Click here to check it out. 3/10 WEARABLE BUTTERFLIES Jean Baruch from Beads of Courage came to the March Board Meeting and one of the things she mentioned is that parents who receive Butterflies after a child's death often like to wear them. She asked if we could make some butterflies that are less fragile and suited to be worn as a pendant. Both of the Butterflies that Marcy Lamberson made at her demo (look at the photos in the Scrapbook) would be suitable. And Robert Simmons is putting together instructions for another wearable Butterfly option. Also this weekend at the Cobb Galleria on Fri Sat &Sun (13-15) is the American Craft Council Show. 3/10 LOREN STUMP and KIM FIELDS AT FLAMETREE There are still a few seats left for the Loren Stump Level 1 April 7-11 Workshop at FlameTree glass. Click here for more information about Loren's class. In August, Kim Fields will be teaching a Flowers and Birds class at Flametree. Call them 678-795-1702 to or click here for more info about Kim's class and to see a sample of her work. THE GREAT SOUTHERN TORCH FACE OFF Prior to our March Meeting on Sat 3/21, starting at 3PM, Southern Flames offers you a rare opportunity to truly get an apples-to-apples comparison of all the torches that are available claiming to be designed for use on O2 concentrators. We are providing an extended meeting day with a variety of torches to play on and information about O2 concentrators. In order to give you the best possible comparison, we are setting up 2 of each of the following type of torches with one on an O2 concentrator and one on bottled O2. We will also have information on concentrators and the advantages and disadvantages of them over bottled oxygen as well as discussion about the use of Natural Gas for lampworking. A supply of glass will be available for those who wish to use their time to make beads for Beads of Courage, but we ask that people bring their own glasses and tools and anything special that they would like to try out on the variety of torches. If you're considering purchasing a new torch or are just curious to try something you haven't before, come out early and play with some fire! POSTCARD BEADS MAY 20 Cristie Prince, Kristy Nijenkamp and Shannon Brickey (Don Meadows wife) have volunteered to create the 2009 SF Postcard that is distributed in the Gathering Postcard Box and displayed on the Southern Flames Website Home Page for an entire year and in the Postcard Archive after that. The deadline for submitting your bead is May 20th - no extensions because we need to meet an ISGB deadline. So get working on your submission - it is really fun to be part of this. Click here for the submission forms or for more information. Any questions contact Cristie Prince or Kristy Nijemkamp. And thanks again to Shannon Brickey for volunteering once again to do the photography and design. 2/19 BEADS OF COURAGE INTERVIEW This interview with Jean Baruch Exectutive Director of BOC, appeared in the Tucson Weekly. It provides a really good overview of the BOC program. Click here to read it. The link was sent to us by Robert Simmons who has been the liaison to BOC from SF and will soon be the coordinator between BOC and the lampwork artist's community for all of the U.S.
2/19 MEET LUCITE GREEN Check out Margie Deeb's February column. It features a bead by Marcy Lamberson. And speaking of Marcy, make sure you read her Artist Spotlight feature in the latest ISGB publication The Bead. The article is also the subject of the editors letter!. 2/16 ISGB SCHOLARSHIP Southern Flames will be sponsoring an ISGB Scholarship. The person will be selected by the ISGB Scholarship Committee but our scholarship will go to a SF member who is also an ISGB member. The deadline for the application is March 15 and details about how to apply can be found on the ISGB site. Click here to see them and remember you must also be an ISGB member at the time of your application. 2/16 THANK YOU !! Thanks go to Diane Kovach, Becky Sizemore, Renee Taylor and Mary Brightwell for cleaning, checking and reorganizing all of the tubing and connections used with the Southern Flames torches. We are grateful to them for keeping us safe! 2/16 WE LOVE ANIMALS BUT..... We love all our pets and your too but for safety reasons we can't have them at any Southern Flames meetings or sponsored events. 2/16 POSTCARD BEADS It is time to start thinking about your bead for the SF postcard. More information at the next meeting. 2/16 ELECTIONS We are looking for nominations for the 2009-2010 Southern Flames Board. If you would like to nominate yourself or someone else let Renee Taylor or another current Board Member know or send an email to the Web Mama. 2/4 REACTIVE GLASS CLASS LOTTERY Julie Ferguson will be teaching a class on using Silver Glass and other special reactive glasses. There will be a single 2-day class. The price is $220 and it will be offered on Saturday and Sunday April 25 - 26. The lottery for this class will be at our February 21 meeting. Click on the links for more information about the class, about Julie and her beads, and for the Lottery from. 2/2 BBD BEADING CLASSES The list of beading and glass classes to be offered at Beads by Design in Feb, March and April is now available on their web site. Photos are class projects are now included. Click here to view the schedule. 2/2 RESOURCE CABINET ADDITIONS Two of Margie Deeb's books (A Beaders Guide to Color and The Beader's Color Palette) were purchased for the Resource Cabinet and will be available at the next meeting for loan. 2/2 COLOR MIXING REFERENCE Kristy Nijenkamp who presented with Margie Deeb at our January meeting suggests that you check out a color mixing chart that was put together by lampworker Kay Powell from information she obtained on the LampworkEtc and Wet Canvas forums. Click here to see the chart and we will also add it to our Tips and Techniques page. 1/21 JAN MEETING PHOTOS Photos from our January meeting with lots of the Margie Deeb/Kristy Nijenkamp presentation. Click here to see them. While both the Web Mama and Andres Lunde contributed photos, we should be especially grateful to Andrew because he takes photos of us that actually make us look good! 1/21 RELEASE A BEAD ISGB is sponsoring a program called Release a Bead. It is really fun and you can read more about it, find out exactly what to do, and see photos of released beads by going to www.releaseabead.com There is a card that you are supposed to include with the bead which you can print it out from the site. Gerry White will also have some already printed out for us to use at Beads by Design. 1/21 FRABEL PRIZE Maureen McRorie of FlameTree Glass won the prestigious Frabel Prize. Click here to see Maureen's winning entry. Congratulations. 1/21 ISGB DUES ISGB Membership year starts in January and if you want to reup or join you can pay your dues from the ISGB Website. Click here for more info. 1/21 BOC IN 60 HOSPITALS Robert Simmons reported that the Beads of Courage program has expanded to sixty hospitals - in the US and other countries. Bob also told us that he will assume the position as National Coordinator between the BOC program and the Beadmaking community. 1/21 BUMPY BEADS FOR BOC The current need of BOC is for bumpy beads - e.g. beads with raised dots. These beads are given to children who have a rough time getting through a treatment or a procedure. 1/21 THE FLOW Marcy Lamberson and Robin Snuttjer are in the current Flow Magazine. 1/21 LEAD WARNING There are beginning to be some studies about health issues related to beads made with glass containing lead. Lead is used as a colorant for some glass and in a reduction flame it may rise to the surface of the bead. Rubino has lots of lead and as we get more information we will share it here. 1/15 MARGIE DEEB UPDATE For the past 4 years Margie has been publishing "Margie's Muse," a free monthly color column available in PDF format. At her presentation on Sat 1/17, she will encourage us to read her January 2009 column, "Making Your Monochromatic Magnificent." . Click here if you want to take a look at it in advance. Also Kristy Nijenkamp who will be presenting with Margie will be referring to color recipes from Drew Fritts book Torchworked Marbles Vol 1. Click here for a preview. Both these links will be permanently listed in our Tips and Techniques section. 1/13 SCULPTURAL GLASS CLASS FILLED Both of Marcy Lamberson's classes are full but if you would like to be on the waiting list, email Margo Knight. 1/8 BEADMAKERS IN IRELAND In May Marjorie Langston and Terry Hale will lead at trip to Ireland in May. Eight are already signed up but there are a couple of spots available. For more information check out www.halefireglass.com/Ireland_2009.html or get in touch with Marjorie Langston. 1/8 ATLANTA GEM EXPO JEWELRY & BEAD SHOW Sat & Sun Jan 10 & 11, 10 AM-5 PM $4 Admission, at Double Tree Hotel 1075 Holcomb Bridge Road, Roswell, GA 30076. Diane Kovach and Donna Myrick (DK Designs) will have a booth at the show. 1/1 SCULPTURAL BEADMAKING A few slots still open in Marcy Lamberson's sculptural beadmaking class for Thurs/Friday Feb 19/20 as is the waiting list for Sat Sun. This is the best deal in a 2 day beadmaking class ever ($135 for SF members; $160 for non members). Marcy will teach a workshop at the 2009 Gathering and it will cost about $400 (plus hotel). The class is now open to the public so the Web Mama urges you to sign up right away if you have been thinking about taking it. .
1/1 BOC THANKS SF Jean Baruch RN, MSN of the Beads of Courage staff sent this lovely thank-you note to Southern Flames. Thank you so much for hosting a Beadathon Day making beads for the children who participate in Beads of Courage! The photos on your scrapbook from the day are Wonderful! It was fun for me to see some familiar faces at the torch! What a great day for the kids. This is truly strengthening the Beads of Courage arts-in-medicine program in more ways than one…..the kids get to see firsthand how the art is made, they get to meet you the bead artist, and the enhanced human connectedness is more healing than you can imagine. It is the very nature of Caring. Thank you for continuing to have the Courage to Care for children coping with cancer and other serious illness. Jean Baruch, RN, BSN Executive Director and Founder Beads of Courage, Inc. (a 501(c)3 tax-exempt organization)"Providing arts-in-medicine, supportive care programs for children coping with serious illness"
1/1 HOLIDAY TREE PHOTOS There are photos of the tree, the beads on the tree, member jewelry, dessert and appetizer closeups and more! Check them out in the SF Scrapbook.